As a young prosecutor, Vincent Bugliosi, put Charles Manson in prison along with his murderous cult. He later wrote the book “Helter Skelter” about the murders and subsequent trials. He was the top of his class at UCLA law school and is known by anyone that knows him as always being the smartest guy in the room. At the time he wrote this book in 2001, he had also just released a highly regarded album of Latin love songs. Quite a guy. 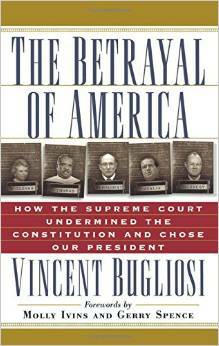 In this short book based on an article he wrote for The Nation magazine, Bugliosi presents the evidence in a conspiracy to anoint a U.S. president without Democracy getting in the way. Above all, his legal arguments make me wonder why Al Gore’s lawyers in December 2000’s Gore v Bush case that was decided by this rogue Supreme Court, did not make any of them. Incompetence or conspiracy? I believe the latter. Only because these were all very very smart people. My 9/11 suspicions are much broader after reading this book. No doubt the Bush administration orchestrated the 9/11 event, but now I suspect complicity with Gore and the DNC, if for nothing other than allowing this to happen. Money can buy you love. I have read many books recently about events that that laid the groundwork for 9/11 and the perpetual fear/war cycle we are in. John Dean’s book about the flawed appointment to the Supreme Court of Chief Justice William Rehnquist, “The Rehnquist Choice” sadly begins the spiral to the tragic events of the initial decade of the 21st Century.